Home-grown apricots, fresh off the tree, are a real summer treat. Growing your own fruit is a rewarding experience. Apricots are relatively easy to grow with proper care. 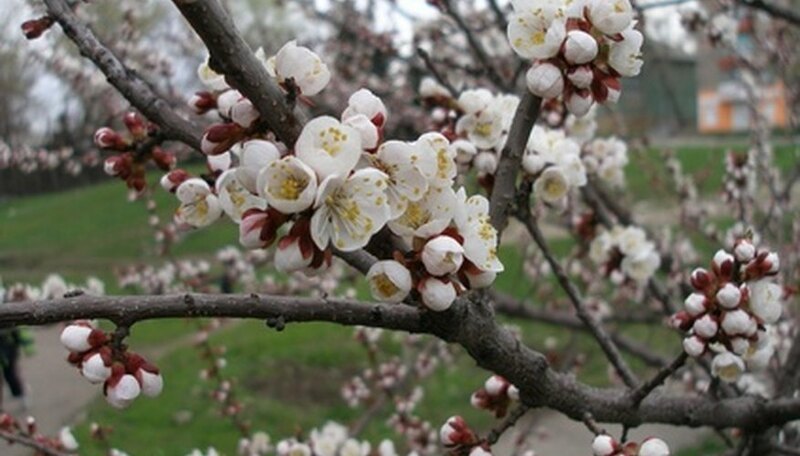 Key to growing healthy apricot trees is good soil nutrition, with the right fertilizer playing a part. Apricot trees grow best in full sun, in moist, well-drained soil. Apricot trees are the most drought-tolerant of the stone fruits and need to be watered only during prolonged periods of drought. The trees should be trimmed so that sunlight can reach all branches. Taking care of fungus and insect pests as soon they appear ensure good good plant health and abundant harvests. At planting, plenty of organic matter should be mixed deeply into the planting hole to improve drainage and natural nutrition. Soil pH should be neutral to slightly acidic--about 6.5. Alkaline and highly acidic soils result in poor nutrient uptake, resulting in chlorosis (leaf yellowing). Apricot's nutritional needs are not great, but they do benefit from annual applications of zinc. Use a balanced fertilizer. Balanced fertilizers have roughly the same amounts of nitrogen (N), phosphorus (P) and potassium (K). N-P-K ratios should be about 10-10-10. Choose a fertilizer with micronutrients, making sure it contains zinc. Zinc can also be applied separately in fall as a granule or a foliar spray. Considering that apricot trees' need for fertilizer is not great, apply fertilizer only when they show signs of malnutrition, such as yellowing leaves, poor fruit production or reduced vigor. Apply fertilizer in early spring. Fertilizer dosages are determined by trunk diameter, so read label instructions. Apply fertilizer 2 feet away from the trunk, extending out to the drip line. Scratch zinc sulfate into the soil in the fall. Alternately, use a zinc foliar spray. Apricot trees planted in deep soil, rich in compost, require little fertilization. Top dress soil each spring with compost to add natural nitrogen. Compost with pulverized egg shells or seashells adds calcium. Use bone meal as a natural, slow-release source of phosphorus. Replenish mulch each spring, which adds organic material as it breaks down.